The very best of Glasgow is on offer with Glasgow Taxis’ City of Glasgow Tour. 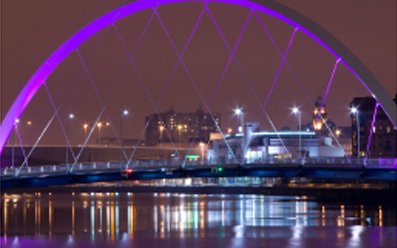 Because Glasgow is such an exciting, welcoming, interesting city, with so much to see and do, one of our bespoke city tours is the ideal way to get your bearings and learn something about the fascination of Glasgow. At the heart of the city is ‘The Style Mile’ – one square mile of the most extraordinary shopping, cafes and restaurants – but Glasgow has so much more to offer than that. There’s the unique architecture of Charles Rennie Mackintosh and of Alexander ‘Greek’ Thomson, not to mention the new Riverside Museum designed by Zaha Hadid. Other architectural gems include, of course, Glasgow City Chambers, which boast the largest marble stairway in Europe. Glasgow Taxis’ specialist city tours can take in the Merchant City, medieval and ancient Glasgow, the amazing Glasgow Necropolis. And if you’re passionate about sport, you can visit Ibrox Stadium or Celtic Park, the National Stadium, and the Scottish Football Museum. The standard City of Glasgow Tour is a one hour excursion which shows you the best of Glasgow with the added benefit of commentary by one of our expert tour guides. The City Tour Plus lasts two hours and ranges wider afield, but the multitude of attractions Glasgow can boast means the tour can be as flexible as you wish, allowing you to follow your own special interests and also to see the very best of Glasgow in a short space of time. The tour can allow for time spent at some of the sites. (From Ocean Terminal, Greenock – £148). Longer or specialised tours are available on request. Costs are per five-seater taxi (six-seater available on request). Both tours include return to ship.